In the 1960s and '70s, Woman's Day magazine featured an article on inexpensive Christmas gifts to make in their November issue. 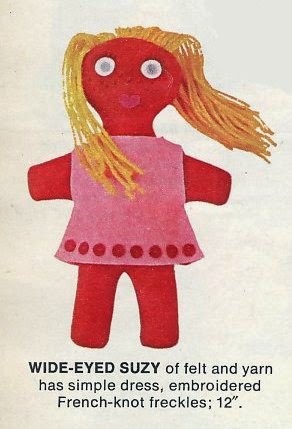 Cloth dolls were always included. 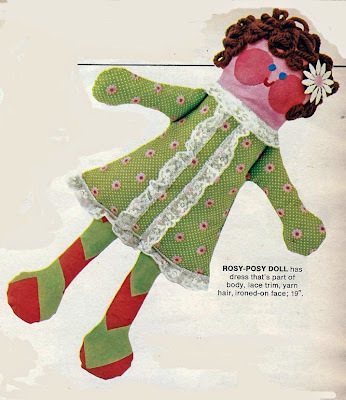 These two dolls, Rosy-Posy and Wide Eyed Suzy, were offered in the November 1968 edition. In addition, two Mother Goose dolls designed by Joan Russell were included in the same issue, with an order form to send away for patterns for the complete set of five. 19" Rosy-Posy is like a pancake doll, except that her front and back are pieced together from three separate fabrics first, then sewn together all at once. Her body and arms are made of print fabric to look like a dress, and gathered lace trim adds to the effect. The instructions call for brightly colored iron-on fabrics to be used for her facial features. I don't think these are widely available now, but with the advent of fusible web like Wonder Under and Stitch Witchery, any fabric can be used. Her hair is made of rug yarn. Wide Eyed Suzy is a 12" pancake doll and meant to be made of felt, with glued-on eyes and mouth and embroidered yarn freckles and eyelashes. Her dress is also felt with appliqued felt dots, and she has yarn hair. The patterns for both dolls are given as tiny grids which need to be enlarged to be used. 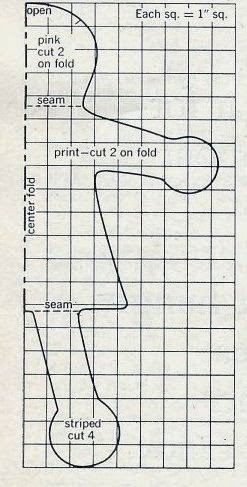 With such simple designs as these, this method is easy enough, even without the use of a scanner or copier. These patterns would make great first sewing projects for young children.